The Trinidad and Tobago National Petroleum Marketing Company (NP) said that it will be carrying out quality checks at its service stations after citizens have raised questions over the quality of fuel being sold. The company issued a notice on Thursday after several complaints by citizens that after filling their tanks, fuel was being consumed much faster than before. The company said however that in keeping with the Metrology Act, the company carries out fuel calibration testing and would be undertaking a fuel verification exercise at its service stations in accordance with the Trinidad and Tobago Bureau of Standards (TTBS). “This will further guarantee that customers get what they pay for at the pump,” the company said. 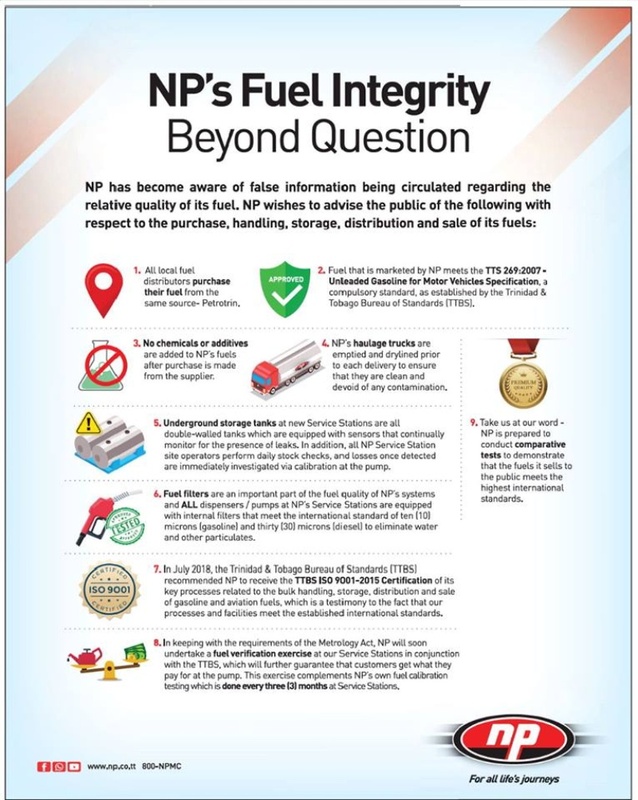 NP insisted that all fuel sold at service stations is purchased from Petrotrin and that this fuel meets ‘TTS 269:2007 – Unleaded Gasoline for Motor Vehicles Specification’, the compulsory standard for fuel quality outlined by the TTBS. The company said its haulage trucks are emptied and drylined before each delivery to ensure they are free of contamination. NP added that the underground storage tanks at new service stations are all double-walled tanks, equipped with sensors, which continually monitor for the presence of leaks. The company said site operators also carry out daily stock checks and any losses which are detected are immediately investigated via calibration at the pump. NP said all dispensers and pumps are equipped with internal fuel filters which meet the international standard of 10 microns (gasoline) and 30 microns (diesel) to eliminate water and other particles. NP added that the TTBS recommended NP receive the TTBS ISO 9001-2015 Certification, which the company said was a testament to the quality of its products. Many citizens commented that in recent weeks they have been filling their tanks more frequently, although they have been travelling the same distances. The comments were made after Petrotrin began importing fuel products for use locally from October 27, 2018. Petrotrin chairman, Wilfred Espinet, told media that the fuel being imported meets local quality standards.